When researching what to do and where to go for my 10 day trip to Switzerland, I came across a lot of different information on what would be best for an itinerary. Switzerland is not that big of a country but there is just so much you can do and see while visiting. I put together this 10 day itinerary to explain exactly what can be done with 10 days in Switzerland as well as walk through all the different logistics and important things to know. Of course this will not hit every attraction or city but it will give you a great taste for what Switzerland has to offer. You will find that the itinerary is a mix between exploring cities and wandering the Alps, with a little bit of everything sprinkled in throughout. I had a one of a kind experience during my trip there and am hoping this can help you experience the same. 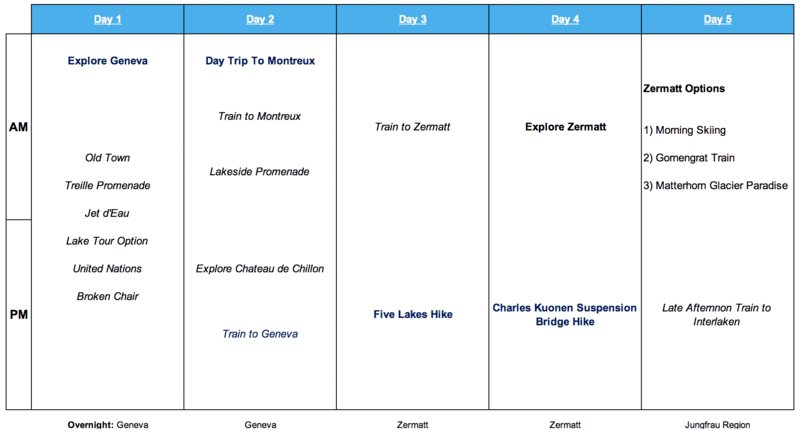 So without further ado, here is a 10 day itinerary for Switzerland. 1) You should check out some of the Switzerland guides I put together that go over train travel, weather, and helpful tips. All of these should be very useful when preparing for your trip. 2) This itinerary is best during the months of June to October but can be altered for other times of year. 3) You should purchase either a Half Fare Card or 8 Day Swiss Travel Pass for this itinerary. You can read more about these options under the train travel guide mentioned above. If you do buy a Swiss Travel Pass, you will begin using it on day 2 so it will be active for the days where you will be traveling the most. 4) Day 1 assumes a full day – either landing the previous night or early on day 1. Same goes for day 10 – either a late evening flight or flight on day 11. 5) The itinerary assumes you will be flying into Geneva and out of Zurich. It is important to note that you can do the itinerary backwards, or you can take one last train at the end of your trip if you were flying into and out of the same city. 6) Do not expect everything to go perfectly according to plan. Weather in the Alps is truly unpredictable at times and can ruin some activities. Always have options in case something will not work out. 7) Throughout the itinerary you will see links for different guides I put together for portions of the trip. Since I did not want to include every piece of information in the itinerary itself as that could get a bit overwhelming, you can check out the guides for many more details on each place. The map shown below shows the 10 day Switzerland itinerary starting in Geneva on the bottom left before stopping in Montreux, Zermatt, Interlaken (Jungfrau Region), Lucerne, and finally Zurich to end the trip. I have also pinned down some of the main cities that you may want to stay in when visiting the Jungfrau region such as Murren, Wengen and Grindelwald. What you won’t see here is each and every attraction that is mentioned in the itinerary (those can be found in the linked guides throughout the page). The map below is more so giving you a sense of where the 10 day itinerary takes you throughout Switzerland. Below you will find a detailed guide for what exactly you will be doing on a day to day basis. Each day gives you a good overview of what to do and what to expect along the way, with some high level logistics of the itinerary. If you want more details for any given day, you can click on the relevant Switzerland guides found throughout the page. These guides will go into greater detail and give you everything you need to know about a city or attraction. Once you are all done wandering around Geneva, make your way back to your hotel and prep yourself for an amazing day trip to Montreux on day 2. Note: if you purchased the 8 Day Swiss Travel Pass, you will not have access to it on Day 1 in Geneva. If you do take public transportation on your first day you will have to pay the full fare (trams and busses). Note: If you purchased the 8 Day Swiss Travel Pass, day 2 would be the first day you will be using it to go back and forth to Montreux. Make your way to the eastern end of Lake Geneva to the lakeside town of Montreux. A short 45 train ride away, it makes for the perfect day trip. Montreux is a charming small town that ramps up in the summer time where locals and tourists gather to take advantage of activities on the beautiful lake and enjoy a view of the Alps at the same time. You can spend the day roaming the town center, walking the promenade, exploring the lake, and then making your way out to Chateau de Chillon – a medieval castle that is must do around the area. For more info about these activities and more check out the Day Trip Guide to Montreux. Once your day in Montreux is complete you can hop back on the train to Geneva, where you can rest up before an early morning out to Zermatt. Important Note: Before jumping into the Alps and hiking section of the trip I want to refer back to one of the tips I mentioned at the beginning – do not expect that every day the weather will be perfect to do each and every one of these hikes / activities at the given time. Feel free to move things around and have alternative options if the weather is not cooperative. You can read up in the Weather in Switzerland Guide for more details about how to prepare. The 10 day Switzerland itinerary will now switch on over to the Alps. Take an early morning train to Zermatt so you can have plenty of time to complete one of the top hikes around the area – the Five Lakes Trail. The earlier you get out the better as the train ride does take about 3.5 hours. Getting to Zermatt before noon will give you enough time to check in, grab some food and head out for the hike. Once you are all ready to go, make your way to the Zermatt – Sunnegga funicular and onwards to Blauherd, where the trail begins. As you walk the trail you will pass by five unique lakes around the area with the Alps and the famous Matterhorn in the backdrop. The hike should take approximately 2.5-3 hours before ending back in Sunnegga, where you can take the funicular back down (depending on time of year the funicular closes around 5-6PM, so be sure to time it correctly as you don’t want to hike all the way down to Zermatt instead). For plenty more information about this hike, take a look at the Five Lakes Hike Guide I put together. Wake up on your second day in Zermatt and take some time to explore this quaint mountainside town and all it has to offer. Make your way towards the river, where you can get some of the best views of the Matterhorn from down below. After walking around the city for a bit and grabbing some lunch it is time to head off to Randa – the start of one of the best hikes around the area. Although not in Zermatt, the Charles Kuonen Suspension Bridge Hike should really be added to your hiking bucket list in the area. It is not an easy hike by any means, but it will sure be worth the effort. After a quick 10 minute train ride from Zermatt you will arrive at the small town of Randa. Start following the signs into the forest and after two hours or so you will arrive at the longest pedestrian suspension bridge in the world. The guide to the Charles Kuonen Suspension Bridge Hike will walk you through all you need to know about completing this trail. Once back in Randa, hop on the train back to Zermatt, where you can get a well deserved rest. On your last day in Zermatt, you can pick from several options depending on what you are most interested in. 1) Summer Skiing – one of the most fascinating things about Zermatt is that it truly offers year-round skiing. This means even in the summer months, you can grab some skis and head up the mountain for a morning of fun. Since you are skiing on a glacier, the ski area does close around 1PM due to poor conditions. Even though it would only be for ~4 or so hours, you should definitely look into it if that is something you want to do. 2) Matterhorn Glacier Paradise – some of the best views of the area can be seen all the way up top at the Glacier Matterhorn Paradise. It takes a few lifts to get up top but once you are there, you will be able to take in some incredible views. You can also visit the Glacier Palace and have some lunch at the restaurant up there. 3) Gornergrat – another great viewing opportunity of the Alps is taking the train up to Gornergrat. You will get fantastic views as you make your way up of all the 4,000 meter peaks alongside the Matterhorn. Once up top there will be a viewing platform and the opportunity to explore the area a bit. Instead of training all the way back down, you can hike to one of the stops along the way. Once you have completed any of the above you can check out of your hotel and head to the train station. Your next stop will be Interlaken / Jungfrau Region. The train takes about 2.5 – 3 hours so you should try to leave Zermatt by mid afternoon if possible. Some of my hotel recommendations in the Jungfrau Region would be..
Day 6 is going to be a long one but you will enjoy every last second of it. As I was planning my trip and looking at pictures from on top of the Schilthorn and down in the Lauterbrunnen valley, I could not believe that these views were real. But believe me they are and you will not want to miss out on them! The logistics to get to Schilthorn will depend on where you are staying, but at the end of the day you will want to make your way to Murren. From Murren you will be able to take a set of two cable cars all the way to Schilthorn. Once up at Schilthorn you will see sweeping views of the Alps with the Eiger, Monch and Jungfrau all in site. Spend a couple hours roaming the viewing platforms, having a drink at the rotating restaurant and checking out Bond World (yes a James Bond movie was filmed here). Once finished with Schilthorn, take the cable car one stop down to Birg, where you can take part of the Thrill Walk – a platform alongside the side of the mountain with a few exhilarating aspects to it. This first portion of the day can be read up in more detail in the Complete Guide to Schilthorn I have up on the site. It will take care of logistics (from towns all over the area), tickets, and top things to do and see. Note that with the Swiss Travel Pass, ALL transportation during this day is included. For me, since I had the pass, it was a no brainer to do Schilthorn over Jungfraujoch (only 25% discount with the Swiss Travel Pass). Of course if you have the time in the region and want to do both, that is definitely possible as well. You can then head back down to Murren, where you can grab some lunch with a view – my top spot here is Hotel Edelweiss – one of my favorite meals of the trip. You can also take some time to explore this car free town and take in some of the amamzing views of the valley below. After lunch it is time to head down to Stechelberg, the start of your Lauterbrunnen journey. To get to Stechelberg from Murren, you can take two cable cars (Murren – Gimmelwald & Gimmelwald – Stechelberg) or you can hike 45 minutes from Murren to Gimmelwald and then cable car down to Stechelberg from there. Once down in Stechelberg, you can begin your walk down the valley back towards Lauterbrunnen. It is one the most beautiful valleys in Switzerland with waterfalls coming down off the sides of the mountain as you pass by small villages along the way. After about 30-45 minutes you will come across Trummelbach Falls – a powerful waterfall inside of the mountain. There is a small entrance fee here but is well worth the visit to the top. After visiting the falls, you can either continue to walk the valley back to Lauterbrunnen or hop on the bus back to the train station. Once there you can make your way back wherever you are staying. Note: this day can easily be done in reverse order: Lauterbrunnen – Trummelbach Falls – Stechelberg – Schilthorn – Birg – Murren. The reason I have Schilthorn first is mostly due to having more time to make sure the weather will be cooperative. If you leave Schilthorn for last, then you risk having a smaller time window for weather to be good for a visit. The second day in the Jungfrau region brings you to First, the base of some great hikes and activities to take part of. To get to First, you must initially get to Grindelwald. Once you reach Grindelwald you just need to hop on the 25 minute cable car all the way up into the Alps. Getting off the cable car in First, you will then be welcomed to some incredible Alps views in every which direction. You can then make your way to the Bachalpsee Lake hiking trail (~1.5 – 2 hours round trip). Although one of the more popular hikes around the area, the views along the way and at the lake itself are some of the best there are. Taking in the views of the Eiger north face was one of the best moments of my trip. If you want to continue hiking onwards there are also plenty of other options to extend the hike from Bachalpsee instead of turning right back around. The Bachalpsee Lake – First Travel Guide will go over the hike in more detail as well as everything you need to know about the area. Once done hiking you can take part of the First Cliff Walk, have lunch at the mountainside restaurant, and enjoy the relaxing view. You will also have the chance to take part of some of the paid First activities – the First Flyer, First Glider, Trottibike and Mountain Cart. The guide mentioned above goes over those as well. Once you are finished in the First area, make your way back to Grindelwald to explore a bit and then back to your hotel for the night. Day 8 of the 10 day Switzerland itinerary brings you to the town of Wengen. Once you arrive in Wengen (if staying elsewhere), make your way to the Mannlichen cable car station. Here you will take the quick ride up the mountain, where the base of some great trails are located. As you arrive, to your left you will see a short trail up a hill. This trail is called the Royal Walk and can be completed in about 30-45 minutes (the way down can be much quicker). Once you finish up the Royal Walk, you can make your way to the start of the famous Mannlichen to Kleine Scheidegg Panorama Trail. The trail starts right at the cable car station and you will see signs pointing you in the right direction. What I loved most about this 1.5 hour trail is that the whole time you are walking, you are either looking down at the beautiful valley to your left or you are looking straight at the famous three mountains of the Alps – the Eiger, Monch and Jungfrau. For more info about logistics, pricing and things to know, check out the Mannlichen to Kleine Scheudegg Panorama Trail Guide I put together. After taking in the trail, you can either hike back the same way to Mannlichen and take the cable car back to Wengen, or hop on a train in Kleine Scheidegg that will take you back to Wengen. Once back in Wengen you can grab some lunch and spend some time exploring the town a bit more. It is time to head out of the Jungfrau region and off to a couple of cities to end the trip. 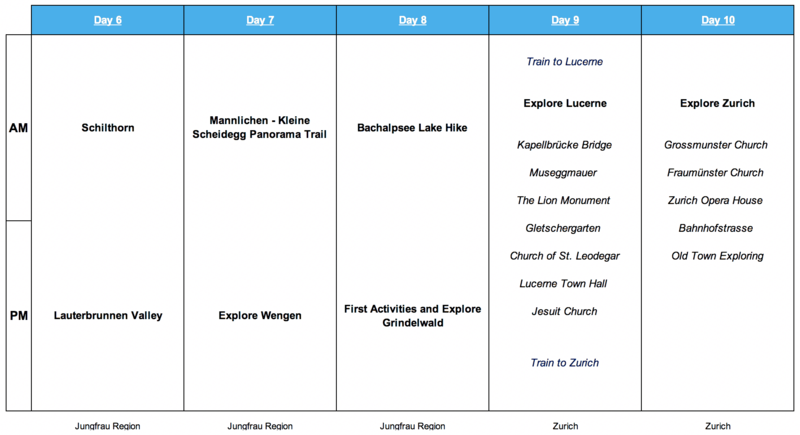 On day 9, check out early from your hotel and catch a train to Lucerne. Note that you will not be staying overnight in Lucerne – rather you will just spend the day there before heading back to the train station later on and making your way to Zurich. Important note: since you will have luggage, you can store it for a few francs in one of the train station lockers for the day. Once back at the station, you can grab your luggage from the locker and head off to Zurich. Beyond all of that I just spent my time wandering the town. The murals on the buildings were just some of the highlights I came across, along with exploring the whole riverfront area. If you have additional time in Switzerland, Lucerne is one place you can add another day or two. Day trips to Mount Pilatus, Titlus and Rigi are all popular options. Being that the last 6 days have been more mountain based, I decided to leave those out for now and just focus on exploring the city itself. After your day in Lucerne is complete, make your way back the train station, grab your bags and head off to Zurich, where you will complete your 10 day Switzerland itinerary. Note: if you bought the 8 Day Swiss Travel Pass, it will no longer be valid for your time in Zurich. Most of the city is walkable so that should not be an issue. Getting to the airport later on day 10 or on day 11 will just require a short and cheap train ride. 1) Grossmunster Church – not only a beautiful church but also one where you can climb to the top for a small fee (5 CHF). It offers some of the best views of the entire city of Zurich. 5) Walk through the Old Town – beyond checking out the churches, most of my day was filled with getting lost in the Old Town (Altstadt). There are plenty of streets to check out and explore. That about wraps up the Switzerland 10 day itinerary, taking you from Geneva to Zurich with plenty of stops and thrills along the way. I feel that this trip was a great mix for me between cities and nature but at the same time, it can be altered to have even more of one or another. There is just so much to do and see in Switzerland and I am hoping this 10 day itinerary can be a great starting point for your trip planning. As always feel free to comment below with any questions and check out all the Switzerland guides I already have up on the site. Safe travels out there and enjoy! !